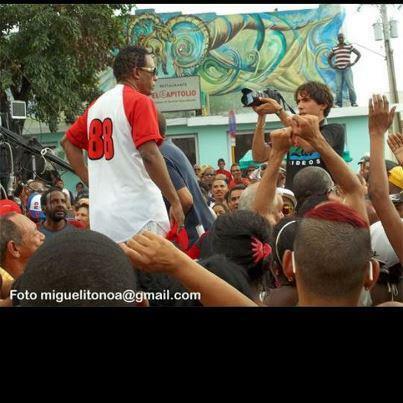 Concert held by Candido Fabre in Santiago de Cuba for the recent harricane Sandy which destroyed much of the city. Con la realización de un Mega Concierto en la Avenida Garzón en pleno corazón de la ciudad de Santiago de Cuba culmino este sábado la grabación de un Vídeo Clip al tema “Te vamos a levantar Santiago” escrito y orquestado por el maestro Cándido Fabré dedicado a los santiagueros después del paso del Huracán Sandy por esa sur oriental provincia cubana. La grabación del Clip Te vamos a … había comenzado el jueves en diferentes locasiones de la ciudad héroe por un equipo de realización convocado para la ocasión y dirigido por los experimentados realizadores Aramys Fonseca y Alden González, con la producción de LIA VIDEOS. El Clip Te vamos a… que se ha convertido ya en himno de espiritualidad para los santiagueros después de los lamentables sucesos ocurridos en esta ciudad por el paso del fenómeno atmosférico, contó en esta ocasión con la participación de la multipremiada conga de Los Hoyos. Que junto al maestro Cándido Fabré arrollaron hasta el cansancio por la céntrica Avenida Garzón hasta llegar al Coppelia La arboleda, lugar donde el sonero cubano junto la Banda que lo acompaña ofrecieron un Mega Concierto hasta pasadas las tres de la madrugada, momentos en el cual Fabré agradeció al pueblo de Santiago de Cuba y a todos los organismos e instituciones que colaboraron en la realización de la obra audio visual. With the completion of a Mega Concert Garzón Avenue in the heart of the city of Santiago de Cuba culminated Saturday recording a video clip to the song “We’re going to raise Santiago” written and orchestrated by master Candido Fabre dedicated to Santiago after Hurricane Sandy for the south eastern Cuban province. The Clip recording … We’ll began on Thursday in the city locasiones different hero for filmmaking team convened for the occasion and led by experienced filmmakers and Alden Gonzalez Fonseca Aramys with VIDEOS LIA production. Welcome to the Latin Music Downloads (www.latinmusicdownloads.com) where you will find music from all corners of Latin America and of African roots. The Latin American Download is one on many projects which comes under umbrella of Tumi Music Ltd. Since 1983 Tumi Music has been at the forefront of the vast and diverse field of Latin music. 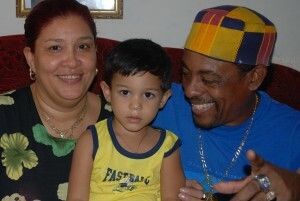 In that year whilst in Bolivia, Mo Fini, founder of Tumi Music, heard the music of Rumillajta and began to promote them. By organizing the first ever European tour by an Andean folk band and releasing City of Stone, Rumillajta’s groundbreaking debut album, Tumi Music was born. During that year, the band headlined all big festivals including Glastonbury Festival, Strawberry Fair, Royal Festival Hall and a sellout venue in Edinburgh Festival, selling over 100,000 cassettes during that summer. Today Tumi Music is regarded with the utmost loyalty and respect by all its musicians in Latin America. By realizing the potential of various musical styles such as Andean folk music and Cuban music well before any of its competitors, Tumi Music has built up an enviable catalogue of over300 new recordings by some of the greatest artists in Latin American and Caribbean music. Tumi Productions has built its reputation on active artist promotion, encouraging a large touring network, providing a long-term commitment to artist development, and producing unique and exciting recordings. Every album is a carefully considered project, and today Tumi is regarded with the utmost loyalty and respect by all its musicians. By realizing the potential of the various musical styles of that vast continent, from Andean folk to Cuban son regardless of trends and well before any of its competitors, Tumi has built an enviable catalogue of recordings by some of the greatest artist in Latin America and the Caribbean. The label has also experimented with ‘cross-borders’ projects, like the excellent award-nominated ‘Banacongo’ collaboration between Papa Noel from Congo and Papi Oviedo from Cuba. Tumi Music has built up a solid reputation based on pro-active artist promotion, a large touring network, exciting recordings, quality packaging and a long term commitment to A&R, regardless of trends or the latest musical fads. Every Tumi Music album is a quality recording, produced by artists expert in their fields and mastered in the highest quality sound studios. Furthermore every production is a carefully thought-out project in itself: expertly designed and beautifully packaged. Latin Music downloads objective is to present you with not only all the Music we have been recording during the last 30 years but the very best of the popular sounds around today such as Son, Salsa. Bossa, Samba, Forro,Merengue,Andean and Cumbia but also to build up an eclectic selection of excellent artists in as diverse fields. and authenticity to the extent that some of our earlier Peruvian music was recorded using instruments used in the grave yard of cultures such as Chancay, Inca, Mochica and Chimu, some which could have been made from human bones and skulls. Our aim is to build one of the strongest links among different cultures all over Latin America and build a platform where all independent musicians and music lovers come together and share and enjoy the Music.